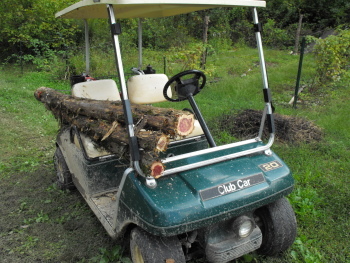 I was working on a small structure to protect the firewood today. Stage 1 is to obtain 4 really long posts to work as the frame. It will be like a mini pole barn without the walls. Reducing our nearby cedar tree population has been on the list of things to do for a while due to the fungal disease known as cedar apple rust. It's always especially sweet when you can get 2 things marked off the list with just one task, although we still have several more cedars that need to come down.